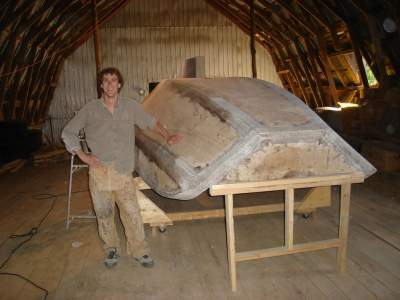 After having rolled the hull I was a little uncertain as to how difficult it would be to install the centerboard box. In the end though I think it worked out quite well. In order to hold the box in position while it was fibreglassed into the hull I slapped together a temporary supporting frame made of 2×4 remains from the original basket mold. It took a number of test fits to get the various members supporting the centerboard box properly adjusted and I was able to stand on the inverted hull and simply lower the box onto my frame from above. Once the box was glued in place I dismantled the frame and applied fibregass tape to all the seams. search isn’t “hunch,” but alternatively “consent. Seeds bank online sites can offer which you range of cannabis pressures.